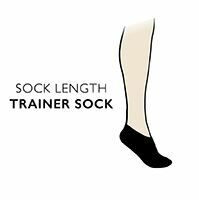 If you're a keen gym bunny or sports shoe wearer, you'll know just how quickly your socks can degrade, becoming less wearable, less protective and less comfortable. With our advanced, cotton rich Storm Bloc with BlueGuard Ankle Trainer Socks, you get socks that are an incredible 46 times more durable than standard branded sports socks. Yet these low ankle length Storm Bloc with BlueGuard Ankle Trainer Socks offer all the benefits you'd expect from the best sports and trainer socks. They're soft and easy to wear, comfortably cushioned just where you need it, with terry loop pile for reduced foot fatigue, breathable panels to aid moisture and heat movement, and include a special woven band in the arch to improve support for all foot types, high arch right through to flat feet. A reinforced toe seam adds to the long life of these high durability, anti-abrasion socks. Supplied in a twin pack, and a choice of attractive colour ways, our ladies Storm Bloc with BlueGuard Ankle Trainer Socks also come with a lifetime guarantee against developing holes.